Yeah!! Evidently it's the first time she's been legal in at least a decade! Perhaps I should elaborate on this post.. I'm surprised I didn't explain the difficulty I went through in registering my Grampian 26.. I had discussed it on a forum or two.. Guess I just forgot to mention it here.. 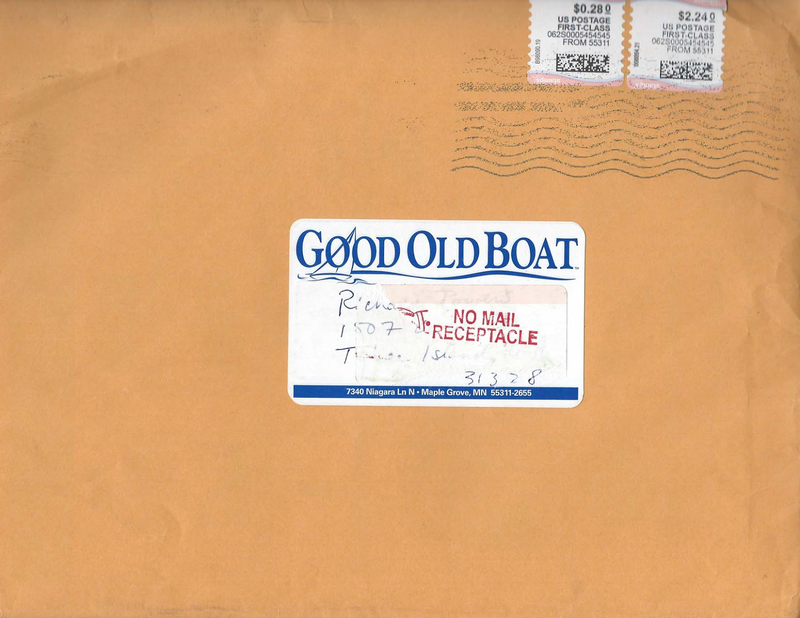 I purchased the boat here in Georgia about 80 miles away, from a private seller; receiving only a bill of sale and a receipt.. The seller owned it approximately 6-8 years but never registered it (which seems a little odd since he is in a well established and rather predominate position with the DNR). The boat resided at Sapelo Island, which if I understand correctly, is considered as private waters, and thus an owner would not be required by the state to register it.. And that's where the difficulty began when I set out to get it registered.. I utilized the online process of registering it, along with some assistance via emails and phone calls with the DNR. By necessity I had to provide a compiled list of documentation in order to compensate for the lack of a Original Title or Previous State Registration Card. Unfortunately, there didn't seem to be much. 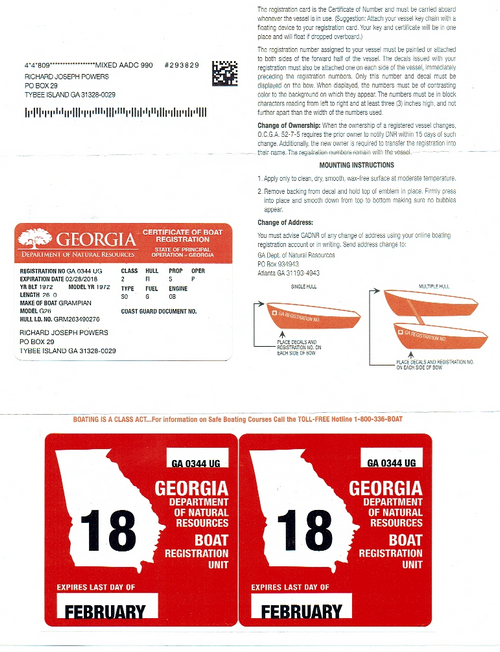 So I download the boat registration database of all registered Georgia boats from georgiawildlife , and thoroughly went through it and found numerous registrations beginning with GA 6059, but found nothing ending with "WU".. I did notice one Grampian 26 registered in Georgia (and two 30 footers), but that's all. 3. Previous Owners. 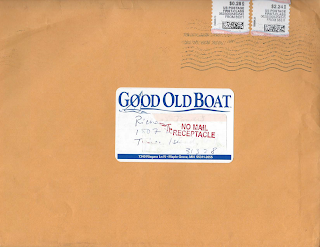 The boat had been given to Fred (the seller) by a man in Lake Lanier numerous years prior. I was able to further confirm that prior owner via an archived page of the GrampianOwners.com, that a Fred Price in Lake Lanier had owned it (hull 349) and had named it "Grace", as shown on this archived page from 02/08/05, and also via this guestbook signing in 8/14/03. In hopes of obtaining some form of documentation; I was unable to make contact that person. Although it was the only solid proof I had, it also was a problem because it was mandatory for the hull number to be at least 7 digits! I sent them a picture of my hull identification plate showing it was only 5 digits long, and also spoke with them on the phone, but they insisted that they needed at least 7 or 8 numbers to enter it into the database... Crazy. 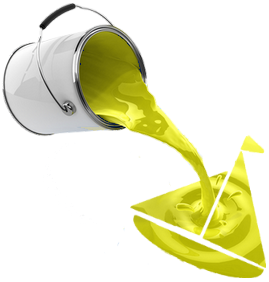 "...The most common has the format GRMsshhhmmyy where GRM is the builder, (GRaMpian), ss is the model (size) of boat, hhh is the hull number and mmyy is the month and year the boat was built. 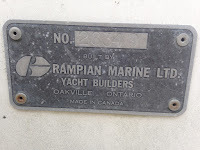 It has been reported that boats built in Canada may have the prefix ZRM and this is in fact registered to Grampian by the US Coastguard http://www.uscgboating.org/recalls/mic1.aspx . No one has ever reported seeing this prefix however. Some owners have reported, especially on older boats that the number on the plate is just sshhh with the same interpretation as above. 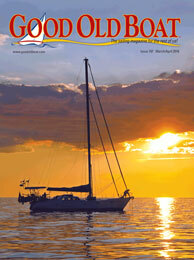 The hull number can often also be found on the mainsail, especially if it is original..."
Ok.. So to register my Grampian 26 I utilized the above keys . I simply added GRM before my number, and 0276 after it (for February 1976).. So my entire HIN became GRM263490276.. Anyway... In the end, after several weeks of calls, emails, and frustration, I finally managed to get it registered with nothing more than the limited bits of information as described here. I suspect perhaps the fact that the DNR employees I was dealing with all seemed to know the seller didn't hurt. Indecently, I had bought the boat being told it was a 1976, however. the Grampian owners database shows that hull number 26349 is actually a 1972 model, so to be more accurate I should have submitted the number GRM263490272 - but what's done is done, so I guess I'll leave well enough alone. 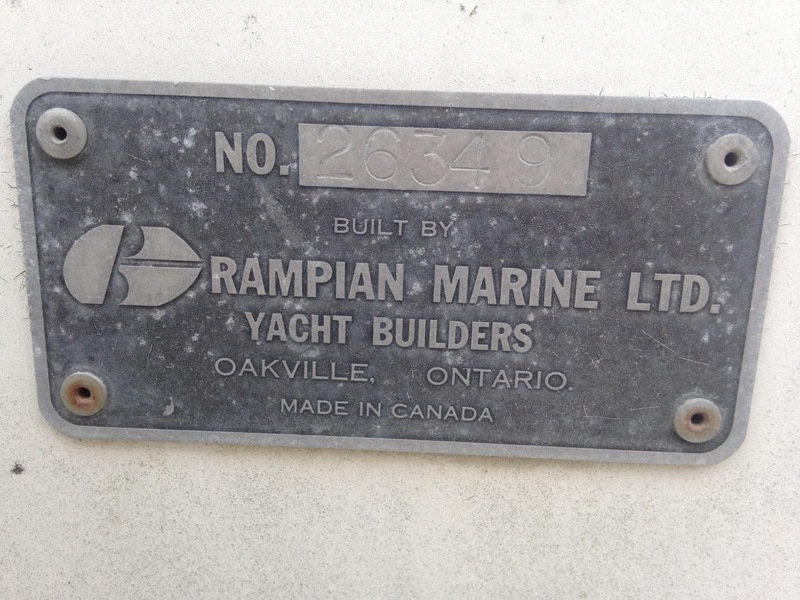 So my 1972 Grampian 26 is registered as a 1976.. Oh well, at least it is registered!